The recent snowfall we’ve had in the last few days has made me reflect that the seasons we experience in our weather are much like seasons in a property business. Throughout the year we expect to experience different seasons. As the year progresses it would be very strange not to feel the changes in sunlight, temperature and climate. Indeed, other countries across the world have very different seasons to our own. They still have seasons and recognise the need for the rainy season and the hot sunny seasons and the dry season. Yet too often we have expectations that our journey in property can always be in summer mode – sunny, bright and positive! But that’s not reality. Seasons create the right environment for growth. Without seasons, we wouldn’t get the fruit, vegetables and produce that we rely on to live. Yet in winter it can be hard to enjoy life in the same way we do in summer. 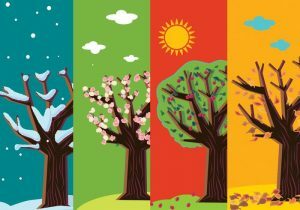 In a property business there are varying seasons – and you might feel right now that it’s like winter. You can’t find the deals, you can’t find the investors, you’re doing lots of viewings and maybe you feel like nothing’s happening and you’re getting nowhere. There’s no shoots, there’s no blossom, there’s no greenery, it feels cold, hard, and icy. At a time like this you need to concentrate on creating YOUR ideal environment for growth. A bit like a compost heap needs time to develop and mature, we also need the right environment to mature into successful property entrepreneurs. What kind of people do you surround yourself with? Are you in the right group of investors? Are you focusing on expansion or contraction? Are you learning the secrets of successful entrepreneurs while you can, or are you retreating – hibernating, cos it all seems just too hard and impossible for you to achieve? I’ve worked with many, many people who felt that they were skating on ice. They didn’t have experience, they didn’t have time. And they didn’t have the right knowledge. Take Keith for example. He was the epitome of a successful businessman, but felt completely stuck in his well-paid job. He wanted to create a reliable extra income stream for himself and his fiancee. He heard about the exceptional returns that HMOs could bring, but had no idea how to do it. He came on my 2-day Multilet Income Multiplier event and learnt exactly how to make his time and money work efficiently by implementing my simple five-step system. In just a few months he had created 3 HMOs and done this with other people’s money! He realised that he was stuck in the winter cycle because he hadn’t taken action towards his goals. When he learnt exactly HOW to create passive income and do it with other people’s money he felt like spring had sprung! The good news for you is that spring is around the corner. If you take action and do what’s needed you can adjust and change your results. If you’re interested in learning more, and would like to get started but have no idea how to start, scale and systemise your HMO portfolio, then I’d like to invite you to my next two day event on March 2nd and 3rd. The usual price is £1497 but I am running a unique charity weekend to raise money for the YMCA – a charity that supports young and vulnerable people who are homeless. The special weekend price is just £400! Yes that’s right a discount of over £1000! All money raised will go to the YMCA. You’ll learn the very same 5 step system that Keith learned and implemented, and is now making him thousands of pounds income per month. You’ll also learn how to sow the right seeds at the right time and in the right way, to get the best deals and to grow your portfolio fast. If you know that this year you really must start to learn how to make this a reality in your life, and make winter turn into summer – then I would urge you to book your place now. At this price, I know the seats will fill up fast, and I wouldn’t want you to miss out. Just like in the natural world that we see around us it won’t be long before you’ll start to see those green shoots that are evidence of your activity paying dividends. You’ll start to see the trees budding, and blossom appearing. Perhaps right now vendors aren’t willing to negotiate with you. Maybe estate agents haven’t got the stock on their books. There’s lots of other economic factors at work that are making it feel like winter, but it will change. If you are in it, if you know what you’re doing, if you know what you’re looking for, if you’re practicing, then when spring comes, you’ll be ready. And then up ahead is summer! Just think about the summer you’re going to have – the kind of rewards you’re going to have and the amount you’re going to be able to reap because you have sown seeds at the right time in the right season. That’s why I’m a big believer in educating yourself about property – how to spot when a deal is a deal, and how to see the conditions for an effective transaction. When autumn comes, that’s the time for looking at your portfolio assessing how well it’s working and whether you’re getting the returns you expected. Perhaps you need to prune it a little bit. Perhaps you need to cut back a bit here, or you need to push forward a bit there, or you need to focus a bit more in another area. Then, of course, there’ll be time for winter again. You’ll be better prepared next time because you’ve gone through it once already and will know exactly how to approach it and how to behave. Seasons are natural and rhythmic but I believe that if we act despite what the weather and our feelings tell us, then we can still make the most of our situation to produce great fruit when the time comes!